In this installment of the Technology and the Arts podcast, we hear from thereminist Kip Rosser, who performed at the recently held 2008 Trenton Computer Festival in Ewing, NJ. We also share some interesting news, web sites and online resources we have come across recently, including Slideshare.net, The Groundlings’ new online video venture, the movie “Google Me,” and more. Hosts: Brian Kelley and John LeMasney. File size: 12 MB. Time: 24 min., 33 sec. Kip Rosser – Kip performed a pair of theremin concerts and presented two demos of the experimental instrument during the weekend-long Trenton Computer Festival that was recently held at The College of New Jersey in Ewing, NJ. Check out the short video excerpt of his performance below. John talked about his “Using Technology to Lose Weight” talks at the 2008 Trenton Computer Festival and for Rider University HealthyU. Brian talks about his recent (and short) Texas vacation (link to pics and videos). John shared his love for Slideshare.net. The Groundlings, the famous Los Angeles-based comedy troupe, are coming to the Web! Jim Killeen, a sometimes actor in Los Angeles, Googled his name, tracked down some of the namesakes he found and made a move about it — Google Me! You can watch the full movie on YouTube! DRM Stinks Reason #456,789…Microsoft announces that it will no longer furnish authorization keys for songs purchased from the long-defunct MSN Music service. In this installment of the Technology and the Arts podcast, we share some interesting news, web sites and online resources we have come across recently, including Flickr’s addition of video hosting and another user revolt; and MySong, an experimental project allowing users to write basic songs with their voices. 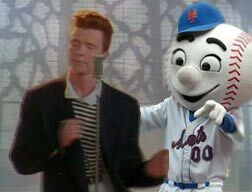 Plus, we’ll discuss the New York Mets getting Rick-Rolled by Internet users, and more. Hosts: Brian Kelley and John LeMasney. File size: 10 MB. Time: 21 min., 05 sec. Note: Show Notes were posted on 4/17, but I back-dated it to 4/16 so it appears below this post on the blog. Brian talks about upcoming gigs for his friend Christian Beach, who is playing the “Writers in Raritan” showcase at DeCicco’s in Raritan, N.J., on April 23, and at Triumph Brew Pub in Philadelphia on June 18. Brian also helped his girlfriend celebrate her birthday recently by taking her to see Mike Doughty at the Fillmore at the TLA in Philly. John’s quest for the ultimate beer takes him to Unibroue. Scratch – a documentary on the art of turntable scratching. The Recording Industry Association of America (RIAA) believes that making a song available on a peer-to-peer file sharing service constitutes copyright infringement. Well, one judge says that is not the case. In this installment of the Technology and the Arts podcast, we share thoughts on Yahoo! Answers, the Jing Project, YuuGuu.com, Photoshop Express and SouthParkStudios.com Plus, we’ll discuss the cool Flip digital video camera, the first-ever playback of what is likely the world’s oldest audio recording from 1860, and more. Hosts: Brian Kelley, John LeMasney. File size: 19.0 MB. Time: 40 min, 03 sec. Brian talks about his recent gig with his friend Christian Beach, who performed a four-song set at The Brighton Bar in Long Branch, N.J., on March 28. The performance was part of a CD release party for “Hero: The Main Man Records Tribute to David Bowie,” on which Christian’s version of “Five Years” (featuring Brian on organ) appears. Brian also talked about his recent trip to the Barnes Foundation museum in Merion, Pa.
TheFlip.com – home of John’s new toy, The Flip camera (pictured above)…and here is David Pogue’s review of The Flip. Article: Should Microsoft throw away Vista? SouthParkStudios.com – Every episode of “South Park” is now online! March 26th was Document Freedom Day! Google Maps Street View captures alleged drug deal going down on the South Side of Chicago. Researchers managed to play back the world’s oldest audio recording for the first time ever. You can listen to it here.